Seamlessly manage critical SharePoint management tasks relative to permissions and groups with SharePoint Manager Plus' efficient management console. 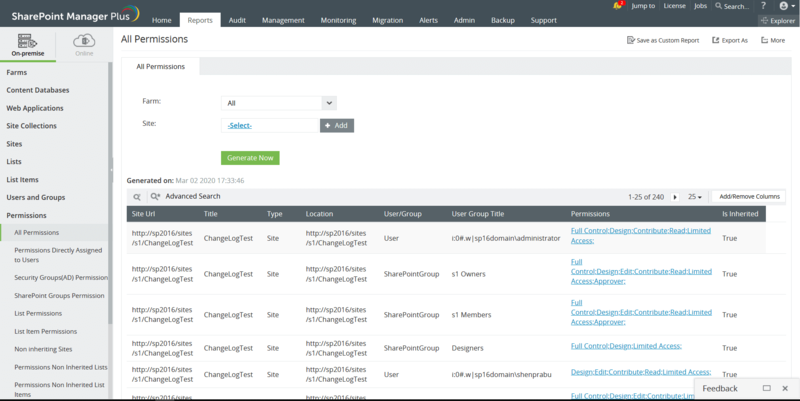 The solution allows administrators to perform actions such as granting, revoking, copying and moving SharePoint permissions, creating and deleting SharePoint groups, copying and moving users across groups, and more with its easy to use interface. 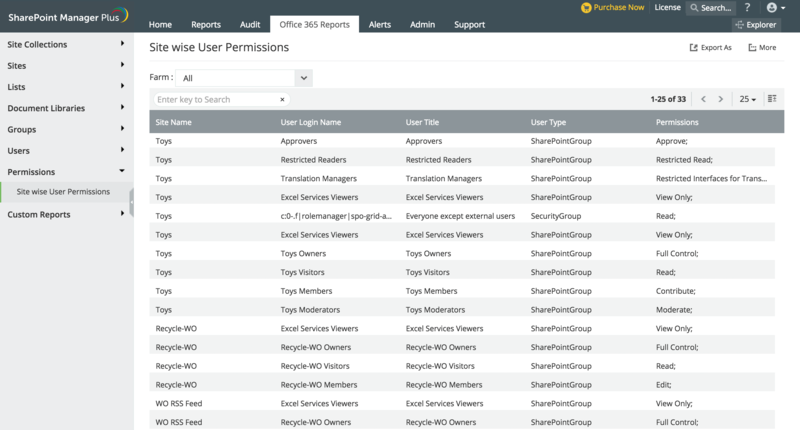 Check the permissions assigned to sites, subsites, document libraries with the predefined report. Adding on, it provides a platform to carry out these management operations for both on-premises and Office365 environment. Further, the solution also provides comprehensive reports on all management operations performed so as to ease auditing woes. 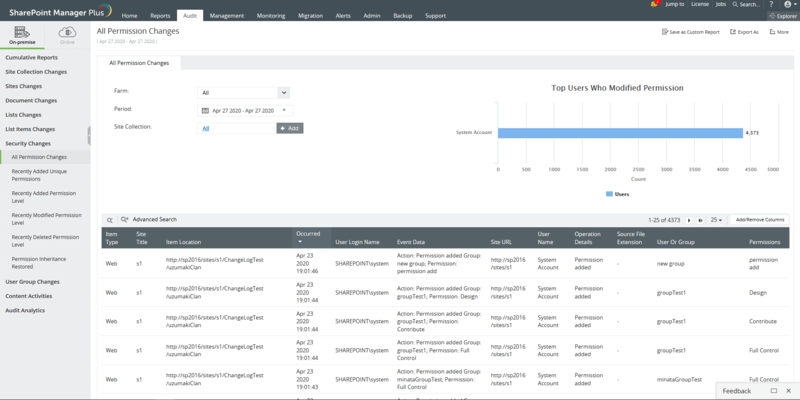 Effectively manage your on-premises server with predefined reports from SharePoint Manager Plus that help in tracking permission changes, identifying group changes, and knowing the detailed list of site users and their privileges. The solution also provides reports that help in gaining in-depth visibility into SharePoint infrastructure by providing detailed information on inventories such as farms, content databases, web applications, site collections and more. The solution helps in ensuring seamless collaboration by providing detailed information on content holding components such as lists and document libraries’ status, attachments, and more. SharePoint Manager Plus provides detailed predefined reports that help to manage Office 365 SharePoint servers as well. 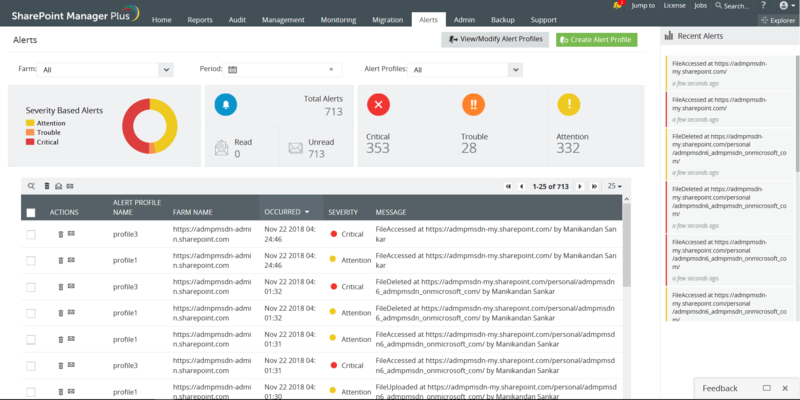 The solution provides complete visibility into Office 365 infrastructure, helps in managing storage space of Office 365 servers, and tracks security level and component level changes, with its extensive reporting feature. SharePoint Manager Plus also allows administrators to archive audit log data from Office 365 servers. SharePoint Manager Plus allows administrators to audit both component level and security level changes. SharePoint Manager Plus allows administrators to view the complete hierarchical architecture of SharePoint deployment. Get a detailed view of both on-premises and Office 365 SharePoint servers with the 'Explorer' tab. SharePoint Manager Plus helps in ensuring seamless information collaboration by detecting mishaps such as critical changes occurring at component level such as site deletion, document deletion, subsite deletion and more. The solution provides Email alert notification to the administrators that has detailed information such as when the change occurred, who made the change and from where. SharePoint Manager Plus also has an option that allows administrators to categorize the alert profile into different severity levels (viz., Attention, Trouble, and Critical) based on the internal needs. The solution's predefined alert criteria are meticulously drafted to meet the auditing requirements of the administrators. The predefined criteria includes all the changes that could happen at the component level and also security level changes such as new group addition, new addition of member to a group, group deletion, group modification, permission changes and more. Most of the IT regulatory mandate such as PCI DSS and SharePoint management best practices specifies that the log data collected for analysis should be archived and stored for forensic analysis.SharePoint Manager Plus help the administrators to meet this most needed requirement ie., archiving audit logs for forensic analysis with its Archive option. The solution archives all the audit logs collected from SharePoint servers for flexible time period. The solution helps administrator to manage database storage space efficiently by allowing them to specify the archive data time period. It also allows the administrator to load the archived log back to database at any point of time, to generate reports and alerts that helps in forensic analysis.